This is not the first time that a rationalist is killed. Narendra Dabholkar, Govind Pansare, M.M. Kalburgi all rationalist, disbeliever of superstitious practices of Hindutva and dissenter of RSS all were killed allegedly by Hindu fundamentalists who remain uncaught by the police in all these years. Gauri Lankesh was also opponent of Hindutva and work actively for naxals, women and dalit rights. The Congress party who is actively criticizing the BJP now for her killing should remember that all of them were killed under Congress ruled states and in spite of criticism shown by them, they haven't able to track the criminals. Voice of dissent is in danger and we must not avoid this killing as an incident in Karnataka because if you oppose religion and has rational thinking then you are also in danger. RSS/BJP supporter actively enjoying the killing of Gauri Lankesh on social media which should also come under criminal offense. Gauri Lankesh could be seen in news debates opposing the topics usually supported by RSS/BJP. 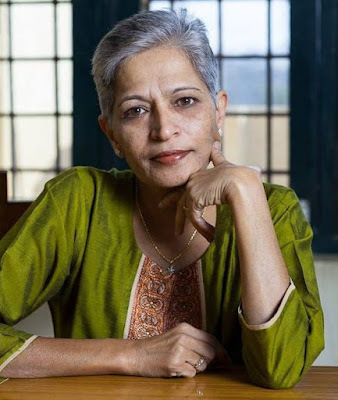 In recent days, Gauri Lankesh was actively involved in bringing many persons involved with the Naxal movement in Karnataka back into the mainstream with the co-operation of the Karnataka government. I appeal Karnataka government which has formed a Special Investigation Team (SIT) on the murder to monitor speedy probe of the issue. Other pending cases of Dabholkar,Pansare, Kalburgi should also be probed speedily. Where is the police teams they show in Crime Patrol which honestly without any pressure solves crimes? This is the time to condemn her death and stood for her beliefs. We must pressurize the government to solve her murder case quickly and raise our voices for such acts. India is not build in last three years and neither by a party, a leader, a family, a religion or an ideology. It is the amalgamation of all these and the quality of people to accommodate each other which make India great. Till next post. God Bless India. As outrage over Tuesday’s brutal murder of journalist-activist Gauri Lankesh spread across the country, the Karnataka government on Wednesday set up a special investigation team and the police claimed to have found vital clues that could lead them to the killers. This is such a disheartening news! I firmly second your thoughts here. One man thinks that he has rebuilt India in the last 3 years. Lankesh's murder is part of the reconstruction.